Join us as people from all over the world flock to Vashon to enjoy the fascinating world of the working sheepdog. The Vashon Sheepdog Classic is the most attended herding event on the West Coast and is held on the breathtaking rolling meadows of Misty Isle Farms. Come and enjoy local fare, fiber arts, and other artisan crafts while you experience this highly regarded national competition. 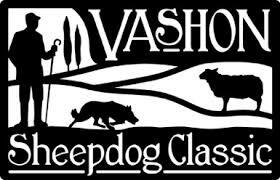 The Vashon Sheepdog Classic gifts the proceeds from the event to island nonprofit organizations that focus on the enrichment of education and health for Vashon youth. 11:00 a.m. - Spirit Garden opens? SW 220th. & Old Mill Road SW.
Thursday June 6th through Sunday June 9th. See Schedule of Events for specific times for events.